A blend of nourishing and conditioning botanical extracts, vitamins and fatty acids that cleanse, hydrate and tame hair to leave it soft and glossy. Three to five times weekly, prior to shampooing, brush dry hair to loosen dirt and disentangle. 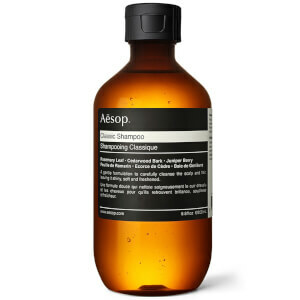 Wet hair thoroughly, pour product into hands, then gently massage onto scalp. Rinse thoroughly. Water (Aqua), Sodium Trideceth Sulfate, Sodium Lauroamphoacetate, Sea Salt (Maris sal), Cocamide MEA, Phenoxyethanol, Borago Officinalis Seed Oil, Citric Acid, Vitis Vinifera (Grape) Seed Oil, Citrus Tangerina (Tangerine), Peel Oil, Lavandula Angustifolia (Lavender) Oil, Disodium EDTA, Tocopherol, Mentha Citrata Leaf Extract, Guar Hydroxypropyltrimonium Chloride, Benzoic Acid, Dehydroacetic Acid, Foeniculum Vulgare (Fennel) Oil, Mentha Piperita (Peppermint) Oil, Rosmarinus Officinalis (Rosemary) Leaf Oil, Salvia Officinalis (Sage) Oil, Ethylhexylglycerin, d-Limonene, Linalool. This ingredient list is subject to change; clients should refer to the product packaging for the most up-to-date ingredient list.